Another major earthquake hit the tourist island of Lombok in Indonesia, days after a massive magnitude-6.9 earthquake on Sunday evening killed more than 300 people. According to Indonesia’s meteorological agency, Thursday’s earthquake struck at a depth of 12.5 miles, originating several miles northwest of Lombok. It is the third earthquake to hit the island in under two weeks. Another major earthquake just hit the tourist island of Lombok in Indonesia, just four days after a massive magnitude-6.9 earthquake struck Lombok island on Sunday evening. At least two people have died and 24 people have been injured in the latest 6.2-magnitude quake, Sutopo Purwo Nugroho, a spokesman for Indonesia’s disaster agency, tweeted on Thursday. Australia’s 9News reported on Friday that the death toll could be as high as six. The quake struck around 12:25 p.m. local time. According to Indonesia’s meteorological agency, the earthquake struck at a depth of 12 kilometers (12.5 miles), originating just several miles northwest of Lombok. It added that the quake will not generate tsunamis. Videos posted by Sutopo show collapsed buildings and widespread destruction, likely compounding fresh damage from quakes which have already devastated the island this month. Sutopo tweeted videos on Thursday showing what appeared to be new damage to buildings and power lines. People in Bali, an island 93 miles from Lombok, also reported feeling the quake. On Sunday, a powerful 6.9-magnitude earthquake devastated the tourist island, which has led to the deaths of at least 347 as of Thursday, according to the state-run Antara news agency. Sunday’s quake also sent some 2,500 people to hospital with serious injuries and drove more than 156,000 people from their homes. And in late July, another 6.4-magnitude earthquake in Lombok killed 16 people and damaged hundreds of houses. 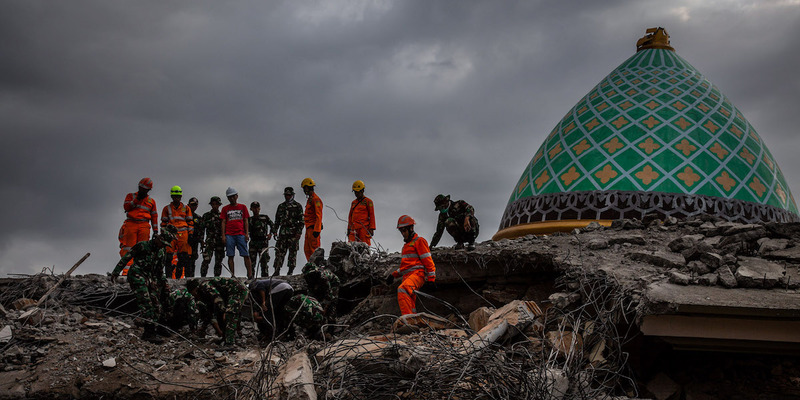 Ulet Ifansasti/GettyIndonesian soldiers looking for victims trapped at a collapsed mosque following an earthquake in Lombok, Indonesia, on August 8. Officials have said that the death toll will likely rise as rescuers continue to sift through the rubble. Rescuers are finding some remote areas hard to reach because bridges and roads have been destroyed by the earthquake. 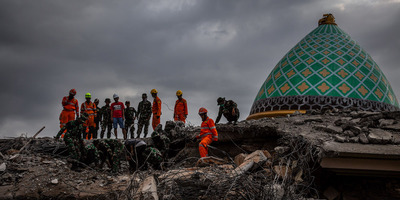 Indonesia is prone to earthquakes as it is situated in the “Ring of Fire,” an area in the basin of the Pacific Ocean where many tremors and volcanic eruptions occur.